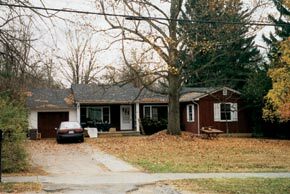 Real Estate Auction: 18 Investment Properties – Woltz & Associates, Inc. Located at the corner of Faculty Street and Progress Street, this well-maintained, two-story brick office building was most recently occupied by Virginia Tech’s Internal Audit and External Audit Offices. The 7,000± sq. ft. building has two wings with separate heat pumps. One wing has 11 offices; the other has 9 offices. A portion of the basement is finished and has also been used for office space. The property has a parking area and there is parking on the street. Property is zoned DC, Downtown Commercial District. Montgomery County Tax Map Parcel No. 256-10 Sec A 1,2. 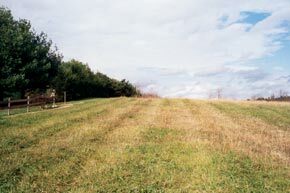 This property offers a two bedroom home situated on .6876± acres. The current monthly rent is $700 with a termination date of July 31, 2004. The property could continued to be utilized as a single family residence or for one of the many other uses permitted under its current GC, General Commercial District zoning. 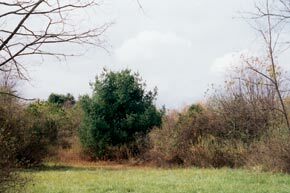 The property is identified as Montgomery County Tax Map Parcel No. 197-9-8. Adjoining the house in Property 2 is this level .5739± ac. which is zoned GC, General Commercial District. The lot is identified as Montgomery County Tax Map Parcel No. 197-9-9. 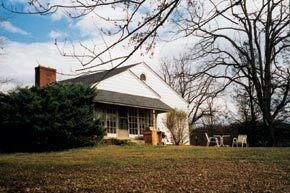 This property features a charming three bedroom, one and one-half bath home on .617± acres located across from Patrick Henry Center. The property is currently utilized as rental property with monthly rent of $740. The current lease terminates July 31, 2004. The property is zoned GC, General Commercial District and is identified as Montgomery County Tax Map Parcel No. 196-A-32. ABSOLUTE: This 4.2020± ac. tract, located on busy South Main Street, is improved with two buildings. The first (1480 South Main) is a 7,434± sq. ft. two-story office building, with 3,937± sq. ft on the main level and 3,497± sq. ft on the upper level. 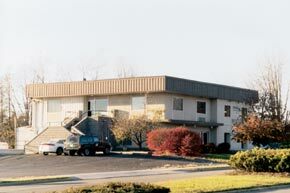 There are nineteen offices, a conference room, five half baths, a kitchenette, computer room and storage space. There is approximately 21,825 sq. ft of paved parking. The second building (1490 South Main) is a 1,664± sq. ft. building with an unfinished 1,004± sq. ft. basement. This building and approximately .345± ac. 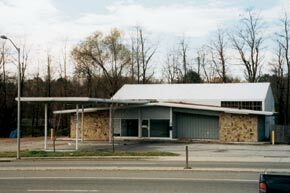 of the property is leased to Enterprise Car Rental through September 30, 2004 for $2,000 per month. There is approximately 5,850 sq. ft. of paved parking with this building. 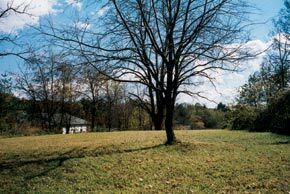 Approximately 3.01± acres of this parcel is unimproved, relatively level, mostly open land behind the two buildings. The current tax assessed value is $957,400. 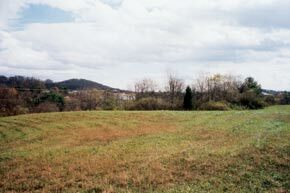 The property is zoned GC, General Commercial District, and is identified as Montgomery County Tax Map Parcel No. 287-A-36. 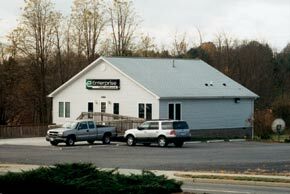 ABSOLUTE: This property, which adjoins Property 5, is located across from Blacksburg Square mall on heavily-traveled South Main Street. The 1.004± ac. tract is improved by a 1,559± sq. ft. building that is currently leased on a month-to-month basis to Streamline Pressure Washing & Auto Detailing for $400 per month. There are two service bays with lifts and overhead doors, an office, a sales area and two restrooms. There is a crossover of South Main Street’s median at this site. The property is zoned GC, General Commercial District and identified as Montgomery County Tax Map Parcel No. 287-A-35. The assessed value is $334,000. ABSOLUTE: Located adjacent to Property 6, this .39± ac. tract is improved with a 2,757± sq. ft. building with canopy. 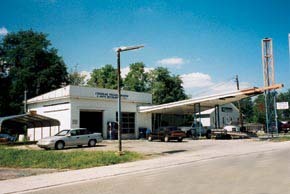 The building was most recently utilized as a Quick Lube facility. The original portion of the building with three rooms and two restrooms is 1,013± sq. ft. and the addition, built in 1998, is 1,744± sq. ft. with two overhead metal doors which permit driving through the building. This parcel is zoned GC, General Commercial District, identified as Montgomery County Tax Map Parcel No. 287-A-34 and has an assessed value of $246,400. ABSOLUTE: Located on this 4.430± ac. 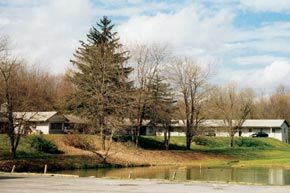 tract are two buildings which overlook a scenic lake. 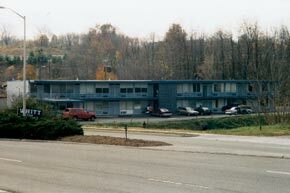 One building, which is adjacent to Lake Terrace Motel (Property 9), faces South Main Street and contains nineteen efficiency apartments which are leased on a weekly and monthly basis. This building is 6,825± sq. ft. and has an open, covered front porch. The second building, which is 4,545± sq. 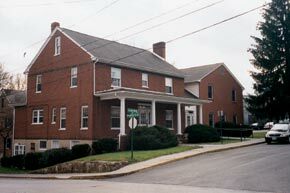 ft. has ten efficiency apartments on the first floor and two apartments in the basement. The year-to-date gross rental income through October 31 for the two buildings was $29,065. The property is zoned GC, General Commercial District. Montgomery County Tax Map Parcel No. 287-A-33. 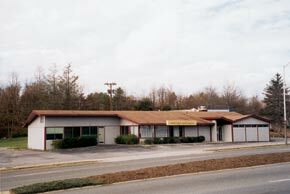 ABSOLUTE: Lake Terrace Motel is located on this .37± ac. parcel. The two-story 16 unit motel is 8,034± sq. ft., with ten motel rooms, a lobby and efficiency unit apartment for the manager on the first floor level and six motel rooms, a 1,630± sq. ft. office suite and two other rooms for office use on the second floor level. The year-to-date gross rental income through October 31 was $94,421. Furnishings are included in sale of real estate. This property is zoned GC, General Commercial District. Montgomery County Tax Map Parcel No. 287-A-32. ABSOLUTE: This 4.7250 ± ac. parcel is a cleared and moderately rolling tract with approximately 200 feet of frontage on King Street It adjoins Properties 8, 9, 11, 12, 14 and 18. The parcel is zoned O, Office District and has an assessed value of $308,700. Montgomery County Tax Map Parcel No. 287-A-28. ABSOLUTE: Property 11, which is 1.174± cleared acres, lies between Property 10 and the rear of residences on the eastern side of Kennedy Avenue. It also adjoins Property 13. This tract is zoned O, Office District and identified as Montgomery County Tax Map Parcel No. 287-A-28A. The tax assessed value is $102,300. ABSOLUTE: Adjoining Property 5, 8, 10, 11 and 13, is this 2.6280± ac. 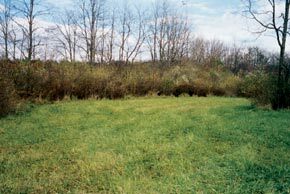 relatively level lot which is mostly cleared with some wooded areas. The property has an assessed value of $171,700 and is zoned O, Office District. Montgomery County Tax Map Parcel No. 287-A-27. ABSOLUTE: This property is contiguous to Properties 11, 12, 15 and 16 and is zoned O, Office District. The 3.126± ac. is mostly wooded and has an assessed value of $340,400. Montgomery County Tax Map Parcel No. 287-A-27A. ABSOLUTE: This 2.8530± acre tract is adjacent to the Lake Terrace Motel and has 383 ft. of frontage on busy South Main Street. It is improved with a 4,400± sq. ft. building that was most recently occupied by Sunrise House Restaurant. 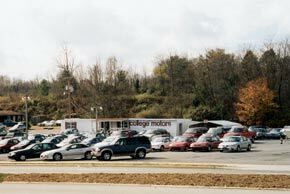 College Motors operates its business on the southern portion of the parcel. The lease is month-to-month with a current monthly rent of $1,500. This property has an assessed value of $584,200, is zoned GC, General Commercial District, and is identified as Montgomery County Tax Map Parcel No. 287-A-31. Located at 801 Airport Road, this property contains 2.89± acres and is improved with a 1,430± sq. ft. three bedroom, two bathroom home. 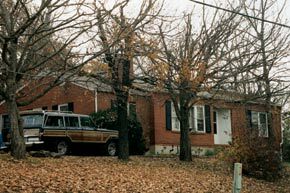 The house, which also has an attached, front porch and full unfinished basement, is leased for $750 per month through July 31, 2004. The property is adjacent to Property 13 and 16 and Margaret Beeks Elementary School. It is a short walk to Gables Shopping Center. Zoning is R-4, Low Density Residential District. Montgomery County Tax Map Parcel No. 287-A-15. This 3.1265± ac. parcel is located next to Property 15 and Property 13. It is improved with a one level home with basement. The main level (1,440± sq. 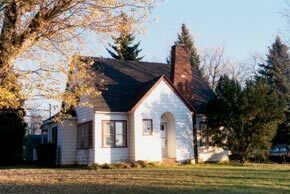 ft.) contains a living/dining area with fireplace and woodstove unit, kitchen, two bedrooms and two full baths. The basement level (1,312± sq. 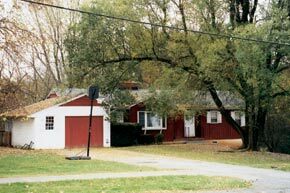 ft.) has a recreation room with fireplace, one bedroom, one full bath and a storage/workshop area. This property is currently leased on a month-to-month basis for $750. The property is zoned R-4, Low Density Residential District and identified as Montgomery County Tax Map Parcel No. 287-A-16. Property 17 offers a .3926± ac. tract with 1,342± sq. ft. three bedroom, two bathroom home with hardwood floors. There is a partially finished basement. The property is currently leased for $835 per month through July 31, 2004. This tract is zoned R-4, Low Density Residential District and identified as Montgomery County Tax Map Parcel No. 317-10-23. ABSOLUTE: This .1767± acre tract is located at the end of King Street and has frontage on Hubbard Street. It is bordered by tracts 10, 11 and 17. The parcel is zoned O, Office District, has an assessed value of $2,500 and is identified as Montgomery County Tax Map Parcel No. 317-A-7. Property 1: From Downtown Blacksburg, at North Main Street and College Avenue, travel north on North Main Street for .10 mi., turn right on Faculty Street and go one block. Building is at the corner of Faculty Street and Progress Street. 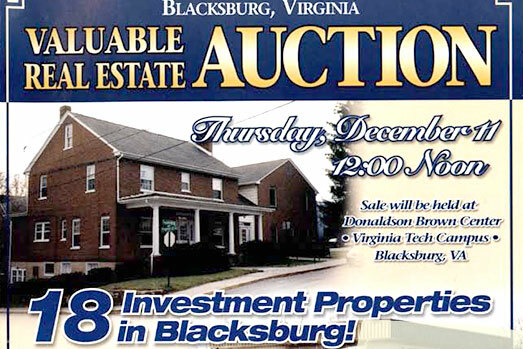 Properties 2 – 4: From Downtown Blacksburg, at North Main Street and College Avenue, travel north on North Main Street for 1.3 mi. to properties on right (across from Patrick Henry Center). travel south on Main Street for 1.3 mi. to Properties 5, 6, 7, 8, 9, 14. Properties 10 -13 and 18 can be most easily accessed by the drive between the buildings on Property 5. From I-81, take Exit 118B (Christiansburg/Blacksburg) and follow 460 West toward Blacksburg. Take Exit 5B (460 West/South Main Street). Go approximately 1.4 mi. to Properties 5, 6, 7, 8, 9 and 14.
travel south on Main Street for 1.1 mi. and turn right on Country Club Drive (Gables Shopping Center). Turn left on Airport Road. Properties 15 and 16 are on the left. 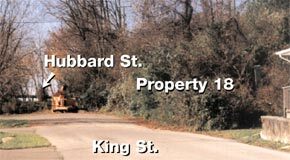 Property 17: Continue on Airport Road, turn left on Hubbard Street. Property is on the left at the corner of Hubbard Street and Kennedy Avenue. From I-81, follow directions above for Properties 5 -14, continue .2 mi. past Property 5 and turn left on Country Club Drive at Gables Shopping Center. Turn left on Airport Road. Properties 15 and 16 are on the left. Property 17: Continue on Airport Road, turn left on Hubbard Street. Property is on the left at the corner of Hubbard Street and Kennedy Avenue. Bids accepted only from registered bidders. Come early for registration at 11:00. All information provided by the Auction Company is deemed reliable, but is not warranted. Bidders should perform such independent investigation with respect to the property as they deem necessary or appropriate. All property is sold “AS IS, WHERE IS.” Please inspect before bidding. ALL SALES FINAL. Announcements day of sale take precedence over all prior releases, verbal and written, concerning this sale. Properties 5, 6, 7, 8, 9, 10, 11, 12, 13, 14 and 18 are being sold at ABSOLUTE AUCTION to the highest bidder. Properties 1, 2, 3, 4, 15, 16 and 17 are being sold subject to Seller confirmation. All sales are final. Detailed terms and conditions provided sale day. A five percent (5%) buyer’s premium will be charged on real estate. The buyer’s premium is added to the high bid on real estate to determine the contract sale price. A ten percent (10%) deposit (based upon the high bid plus the buyer’s premium) shall be due on day of sale immediately following the sale. The ten percent (10%) deposit is payable by cashier’s check, cash, wire transfer into Auction Company’s escrow account or a pre-approved personal check. In order to have a check pre-approved, the bidder must present at registration a letter from its bank stating that the bidder has an account in good standing. The balance of the purchase price of the real estate is due at settlement on or before January 12, 2004, payable by cash or cashier’s check. Real estate to be conveyed by general warranty deed free and clear of liens, subject however, to any rights of way, easements and restrictions of record. All properties are sold subject to existing leases.